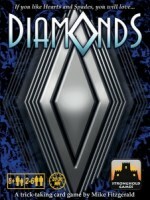 Diamonds is designed by the master of card games, Mike Fitzgerald. We are proud to make Mike's game the first in the new "Pocket Line" for Stronghold Games. Add a Review for "Diamonds"